The tickets come in two parts. Display one part in your car, and produce the other to claim a refund when spending £5 or more in the shop. Anyone staying longer than 3 hours is liable to a £60 fine, although it’s debatable whether such fines can be enforced. 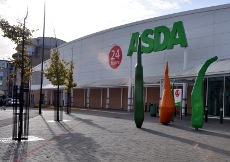 Technically in West Green, Asda is close to Crawley town centre, just off the High Street. It was built on the site of Vine Cottage, the former home of the writer, Mark Lemon.